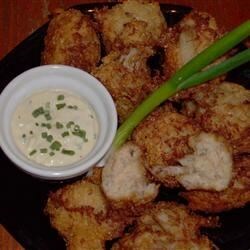 "Crab fritters are fried and served with a garlic and horseradish dipping sauce. Super simple, yet elegant enough to serve to company!" In the container of a food processor, combine the mayonnaise, mustard, horseradish, garlic, and lemon juice. Process until well blended. Transfer to a bowl, stir in chives, cover and refrigerate until ready to serve. Heat the oil in a heavy saucepan or deep fryer to 375 degrees F (190 degrees C). Stir together the hush puppy mix, milk and egg until smooth. Fold in the crab. Drop tablespoonfuls of the batter into the hot oil. Fry until golden brown, 2 to 3 minutes, turning once if needed. Drain on paper towels. Serve fritters with the garlic sauce. Need some seasonings in the fritter mix and the sauce was ok. I will make again with some seasonings next time. Very easy, very tasty. Warning that this recipe makes A LOT! One batch is enough to take to a party. Each teaspoon full of batter puffs up to about 3 times its size. "FANTASTIC!! "I love the sauce,too! !One of the best recipes I've gotten here! I love this recipe. It's simple and very good. Love the sauce that goes along with the fritters. This recipe is good..you've gotta try these. I made these for a Halloween party....they were awesome!!!! They were gone within 10 minutes. Will be making these for my upcoming holiday parties. very good. followed the recipe to the tee! i love the sauce too. definately a remaker!